Tawny joined the Life EMS team in 2017 as an EMT/EVO, and she has been an integral part of the team since. She generously gives of her time and does whatever is asked of her unselfishly. 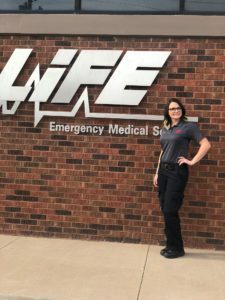 Tawny attended EMT-Basic training, then she went on to attain a National Registry Certification and the State of Oklahoma EMT License. The public safety field was certainly not new territory for Tawny. Before deciding to become an EMT and pursue a career in EMS, she served as a reserve patrol and juvenile detention officer. Tawny is married to Michael Ward, and they have a two-year-old daughter, Juliana. Life EMS congratulates Tawny for being chosen by her fellow employees to represent Life EMS as a 2018 Star of Life.